This correspondence includes letters received by the Kansas Adjutant General on a variety of topics but most of the letters request arms or troops to protect settlers from feared raids by Indians in the area. Many letters also inform the state of the enrollment of local militias for such protection in absence of assistance by state units. Requests for information on filing claims for damage from Indian raids are also included, as are requests on Price Raid claims. The correspondents often identify groups of Indians and their location. Tribes mentioned include the Cheyenne, Sioux, Comanche, Kiowa, Pawnee, Otoe, and Omaha. 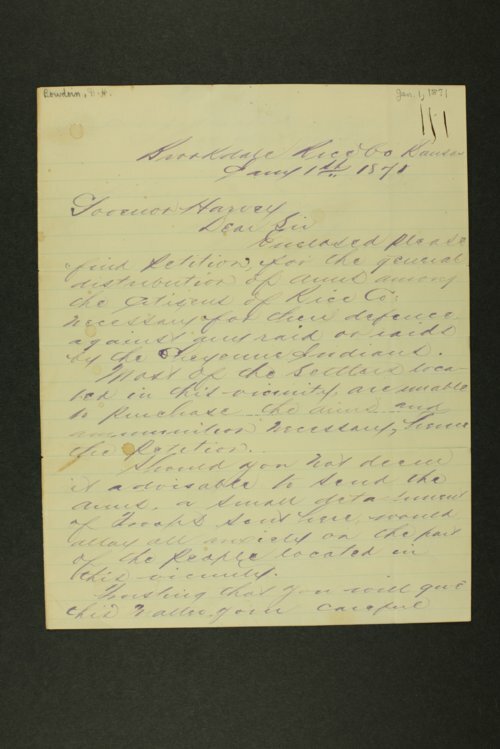 March 31st correspondence from the Department of the Missouri commander John Pope at Leavenworth informs Governor James Harvey of Indians given permission by the Indian Bureau to hunt buffalo between the Solomon and Arkansas rivers, particularly Red Cloud and other bands of Sioux. An April 4th letter from Governor Harvey orders Adjutant General David Whittaker to proceed to the frontier to inform the settlements of such permission and to avoid conflict.